Results from the 2018 Global Peace Index, a quantitative measure of peace across 163 countries, show that Europe remains the most peaceful region in the world. But as José Luengo-Cabrera (Institute of Economics & Peace) notes, Europe’s peacefulness has been deteriorating in recent years. He argues that this deterioration has provided fertile ground for the rise of populist parties. Since the inception of the Global Peace Index (GPI) just over a decade ago, Europe has consistently ranked as the most peaceful region worldwide. 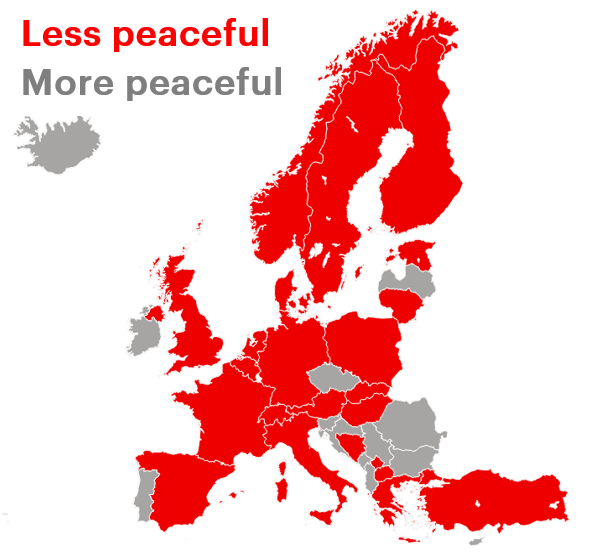 But although results from the 2018 GPI show that 20 of the 30 most peaceful countries in the world are European, they also show that the region’s level of peace has been deteriorating for the last three years in a row. While many conflating factors are at play, the drivers behind Europe’s deteriorating peace are those that populist parties have capitalised on (and stoked) for political ends. The recurrence of terrorist attacks across European cities and the unprecedented inflow of refugees have contributed to an accruing sense of social acrimony, one that has arguably bolstered the appeal of populist parties. Economic woes have also played a role, themselves exacerbated by growing insecurity. Simplistic by default, divisive in nature and often lacking in factual veracity, the populist discourse has been attracting a larger share of the European electorate. 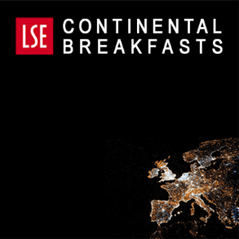 Deteriorating trends across indicators of a quantitative measure of peace shed light on the centrifugal forces pulling Europe’s political centre of gravity towards the fringes. The deterioration in Europe’s GPI score over the last three years is larger than the one recorded in Sub-Saharan Africa and South Asia, two of the most conflictive regions in the world, but smaller than the one for the Middle East and North Africa, the least peaceful region in the 2018 GPI ranking. This is not only the result of a larger number of indicators worsening for Europe, but also due to the higher magnitude of deteriorations vis-à-vis improvements. Overall, 56 per cent of the indicators comprised in the GPI score for Europe deteriorated between 2015 and 2018, with the average magnitude of deteriorating indicators at more than twice the level of improving ones. Note: The GPI score is banded on a scale from 1 to 5, with a score of 1 being the most peaceful and a score of 5 the least peaceful. Data from the Institute for Economics & Peace (IEP). The indicators that deteriorated the most during this time period were those measuring relations with neighbouring countries, involvement in external conflicts, the impact of terrorism, the degree of political terror and the intensity of internal conflicts (a full description of the indicators and what they measure is available in the appendix section of the 2018 report). Note: Data from the Institute for Economics & Peace (IEP). These are just five of the 23 indicators included in the GPI score for Europe, itself an average of GPI scores across 36 European countries, including Turkey. But the average magnitude of their deterioration over the past three years is three times larger than that of the top five improving indicators. This deterioration is reflective of Europe’s worsening security environment. Indeed, the refugee crisis has been a catalyst for rising political tensions between countries sharing borders, while the recurrence of terrorist attacks and intensifying social conflict in the form of violent clashes pitting protesters against security forces and hate crimes perpetrated against foreigners have had an adverse impact on the levels of social capital, albeit to varying degrees in different European countries. Although Europe’s 2018 GPI score reflects that the region is today more peaceful than at the height of the global financial crisis in 2010, growing social and economic insecurity has arguably increased the political salience of populist parties across Europe. European countries that have suffered acts of terrorism and absorbed significant numbers of refugees in the past three years have recorded the largest deteriorations in their GPI scores. Among the countries that saw their GPI score deteriorate the most between 2015 and 2018 are Spain, Turkey, the UK, Poland, Hungary, Italy, France and Germany. Overall, 66 per cent of European countries saw their GPI score deteriorate during this period. Changing perceptions reflect the deterioration in peace, especially as the percentage of EU citizens reporting terrorism and immigration as the most important issue facing the EU has been on an upward trend. This highlights the degree to which these two phenomena have taken precedence in the minds of the European public, particularly when considering that they ranked more than ten percentage points higher than other issues like the economic situation, the state of Member States’ public finances or unemployment in the latest Eurobarometer. Note: Figures are an average for the EU. Data from Eurobarometer. Attitudinal data from 2016, at the height of the refugee crisis, showed that more than 60 per cent of citizens in ten European countries disapproved of the EU’s handling of the crisis, with figures over 80 per cent in Greece and Sweden. In tandem, over 50 per cent of citizens in eight of these ten countries reported a belief that refugees increased the likelihood of terrorism, with figures over 70 per cent in Hungary and Poland. Note: Data from Pew Research Centre, Global Attitudes Survey. By capitalising on the fears and frustrations of European citizens towards terrorism, refugees and economic shocks, populist parties at both national and European parliamentary elections have increased their vote shares. In Germany, for example, the popular dissatisfaction over the handling of the refugee crisis allowed the Alternative for Germany (AfD), an anti-immigration populist party, to gain political ground. Relative to the previous election, the AfD increased its share of seats in the Bundestag from 4.7 to 12.6 per cent in the September 2017 election, becoming the third largest political force in the country. Correlation analysis shows that there is a positive and statistically significant relation between the AfD’s vote share and the percentage of Germans across the 16 federal states reporting that they prefer not to have foreigners or migrants as neighbours. Note: Data from Der Bundeswahlleiter, Destatis, Bertelsmann Stiftung. This is most evident in states with smaller populations, which is the case for all eastern states, with the exception of Berlin. The correlation between the AfD’s vote share and household income per capita is negative and statistically significant, highlighting that the AfD’s vote share is highest in poorer states. Similar patterns have been observed across Europe. When taking the ten European countries with the largest increase in vote shares won by right-wing populist parties between the most recent election and the previous one, the average vote share went from 18 to 27 per cent. The largest increases were recorded in Austria, France, Italy, Sweden and Germany. At the European level, populist parties in 20 of the 28 member states of the EU won a higher percentage of the vote in the European Parliament elections in 2014 than in 2009. 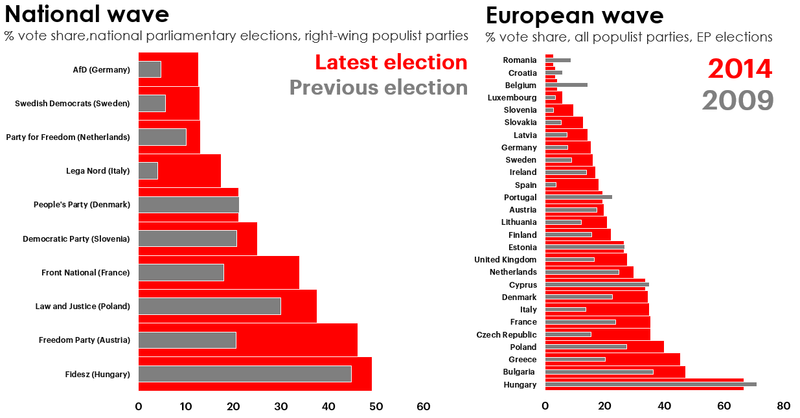 As things currently stand, particularly in the wake of the recent populist wins in Italy and Slovenia, the 2019 EP elections are likely to be characterised by similar or higher vote shares for populist parties. Note: The parties defined as ‘populist’ for the EP elections are those categorised as such by the Foundation for European Progressive Studies. Data from European Election Database. Although Europe remains the most peaceful region relative to its global peers, a worsening security environment at a time of lingering economic uncertainty has provided fertile ground for the rise of populist parties. Given the calls made by European institutions for more evidence-based policy making, quantitative measures like the GPI can, at the very least, help identify and pre-empt trends considered to have adverse effects on the social, political and economic fabric of the region. Via the use of actionable analytical tools pertinent to tracking the evolution of indicators measuring the state of peace across different European countries, policymaking could benefit from greater reliance on quantifiable, and indeed verifiable, evidence for addressing the social grievances and economic disparities that have propagated the populist tide in Europe. 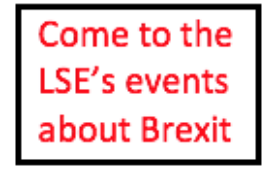 This article gives the views of the author(s), and not the position of LSE Brexit, nor of the London School of Economics and Political Science. It first appeared on EUROPP – European Politics and Policy. Firstly, not all of the migrants that have poured into Europe over the last few years are genuine refugees, in fact a large percentage of them have been economic migrants entering Europe illegally and once in a European country have made their way to other European countries. It is typical of articles such as this to blithely refer to “refugees” as it suits the content and tone of the article. There are a number of reasons why the electorates of the various countries which make up the EU and this article either does not refer to them or where it does it is in passing. With the exception of Orban who took steps to stop the influx and bravely ordered his countries borders to be fortified and refused to allow people in. Virtually no other countries did so and their political leaders tried to impose censorship of news stories which involved immigrants. And then of course there’s Merkel. tired phrase means) “capitalising on and stoking the issues for their own ends”, what nonsense, they do not need to do any such thing, the electorates are turning to them because they are fed up of being lied to, ignored and taken for granted. I would have thought that by now even the dimmest people would have realized that the purpose of the EU is to destroy the cultures & religions of every country in the EU in order to hasten the formation of a Superstate of dumbed-down, mixed race serfs. .You only have to glance at a boat-load of “refugees” to see that they are almost entirely young males. Presumably they have left their wives, daughters, mothers and sisters to fight “the war” back home? Come on – pull yourself together. I can’t decide whether you LSE people actually believe your own articles or whether you really do live in a completely different, make-believe world. Rather than plotting graphs and pie-charts, you need to get out and have a look at London, Paris, Brussels, Malmo, Munich, even Dublin to see the crime and destruction that is taking place. It’s no accident. It’s all planned.